This mother and cub pair was spotted by PolarQuest team based in Longyearbyen. 9 Aug 2018 – Text by Paola Catapano. PolarQuest2018 is not only a scientific mission – it also features a great deal of adventure! For instance, we are searching for quite a few lost objects. Some are as big and as important as airships, but others are smaller and – at least to their owners – equally as important. When we were at the Italian research station a few days ago in Ny Alesund, Stefano Ventura, a permafrost researcher from CNR Florence, tasked us with a new search as soon as he learned we were sailing North. 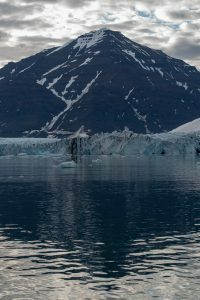 In 2008, he placed a dozen temperature and luminosity sensors around some hot spring lakes in Bockfjorden, on the North coast of the Spitsbergen island. Unfortunately, he never got the opportunity to get them back. Stefano gave us a complete list of the sensors, together with their GPS locations and pictures… exactly like a treasure hunt! Our team did not hesitate a single moment to accept the challenge. As soon as we reached Bockfjorden this morning at dawn, after a hearty breakfast, a party of six ventured to the hot spring lakes to search for the sensors. Of course, we were armed with everything you need according to local laws (and good habits) in case of a bear encounter. We reached the beach after 15′ on the tender. As we walked these wild shores, we could not help feeling bad as the only representatives of our species. While the sea had brought over birch trunks from Siberia, it also deposited milk packages (with Russian text, validating the Siberian origin of the trunks), shampoo bottles, ice cream boxes, shreds of plastic bags and broken fishermen nets. Following the GPS coordinates of the springs, we walked 7 miles amidst lunar landscapes, across ice-chilled rivers, and over stones brought down by the glaciers. Until we reached the site of the Troll springs, one of the most ancient areas of the entire archipelago and the only one left with some feeble volcanic activities. Beautiful bubbling ponds with pleasantly lukewarm water (between 20 and 30 degrees C) are our search field today. But despite the very precise position given to us by Stefano, we find no trace of sensors. Feeling a bit cold from the river crossing, we headed back to the beach where we left our tender. But a huge surprise awaited us just at the foot of the waterfall, in the riverbed nearby: the full skeleton, including the head and part of the skin, of a dead polar bear! The sight is quite scary as the death of the animal seemed quite recent, judging from the remains of its skin and fur all around. In one piece of the skin we find… a tracker collar! These are at times used by researchers to track these animals. We carefully cut it out to bring it back to the boat and inform the research team back in Ny Alesund. We walked back towards the tender, more aware than before that such an encounter with a live animal is never to be excluded on these lands. Bear footprints in the sand a few metres away only confirm our awareness. 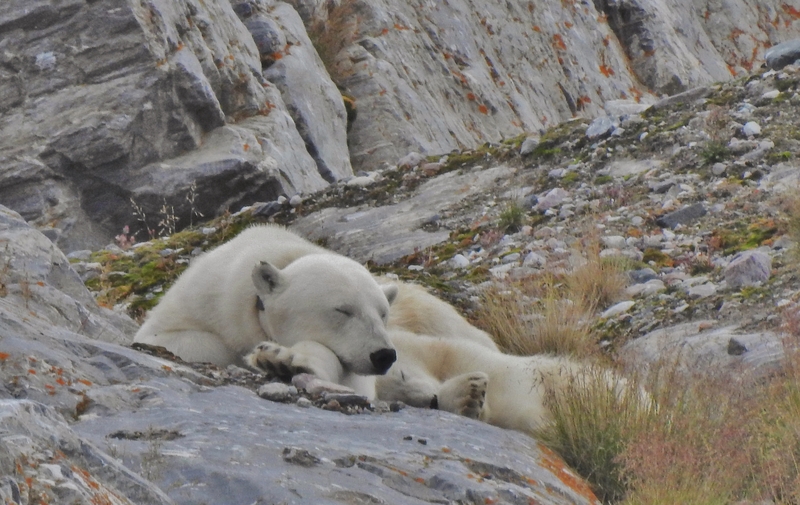 So we set off to find some temperature sensors and we come back with a polar bear tracking device… not a bad outcome for our first quest on land!